A major new report has just been issued by the UW Climate Impacts Group. For the first time it gives detailed predictions for sea level rise that is mapped throughout Washington’s coast line, including Puget Sound. Vashon is covered by 6 overlapping study regions, as shown in the map to the right. Vashon Maury Island Radio Club and VashonBePrepared invite the public to visit Vashon’s amateur radio volunteers at next Saturday’s 2018 Field Day event! You’re invited to a South Seattle Home Fair on February 10, 2018, hosted by the Seattle Department of Construction and Inspections. Here’s your chance to ask an expert about your planned remodel and our permitting process and code requirements. You can also get information about rental housing rules, homeowner assistance, landslide awareness, and much, much more. Who: Whether you’re a homeowner, landlord, renter, or potential homeowner, this event has something for you. When: Saturday, February 10, 2018 10:00 a.m. – 2:00 p.m.
Help your family, neighborhood and community be more prepared! This Saturday VashonBePrepared sponsors the Prepare Fair, from 10am till 2pm at the main fire station. Field Day 2017: This Saturday with a New Location! Vashon Maury Island Radio Club and VashonBePrepared invites the public to visit Vashon’s amateur radio volunteers at this Saturday’s 2017 Field Day event! Vashon Hams gather at our new Field Day location atop the Swallow’s Nest Bluff on June 24th & 25th to compete in the largest single amateur radio and emergency preparedness exercise. SEATTLE – A year following one of the nation’s largest domestic drills, lessons-learned continue to guide strategies that improve the Pacific Northwest’s ability to survive and recover from a catastrophic Cascadia Subduction Zone (CSZ) earthquake and tsunami. DHS starts on page 23 of the 62 page document. FEMA preparedness grant language is on page 24. Your Bookmarks Will Need To Change Too! The National Weather Service’s primary web site www.weather.gov plans to implement an upgrade. The improvement will involve the point ‘n click site specific forecasts and zone forecasts. Once these changes occur on March 7, all your current forecast.weather.gov bookmarks will change. Links to a specific forecast page will display an error message that includes a URL to the new web site location. That is your opportunity to update your bookmarks to provide access to NWS forecasts quickly after the upgrade. Date: May 5th, 6th, 7th. **Testing for any level amateur license will be available and open to anyone. Cost $15. Place: Vashon Island Fire & Rescue, Main Station 55 - SW Bank Rd. Training class will prepare the participant to take the technician's level amateur radio test being given Sunday, May 7th. The Refresher is an 8-hour review of medical and SAR (Search and Rescue), plus lots of updates for people who took the basic course awhile ago and would like to join the active team. The course is held in two 4-hour sessions on Friday evenings. The directive establishes a new Resilient Washington subcabinet charged with providing a coordinated approach to preparing for and responding to a major earthquake or tsunami. The subcabinet’s efforts will address everything from educating the public about personal preparedness to planning for major disruptions to utility and fuel services and destruction of major roads, bridges and airports. The subcabinet will also develop recommendations and plans for ensuring availability of medical and human service operations. The Seattle Times took a look at the Cascadia Rising final draft report: we failed. Not so much Vashon, but the state. The Seattle/King County Clinic is a giant four-day FREE clinic. Healthcare professionals from around the region volunteer to provide quality dental, vision, and medical care. Patients receive free healthcare services including dental fillings and extractions, complete eye exams, free prescription eyeglasses, mammograms, Pap smears, flu vaccine, foot care, and much more. VashonBePrepared held its annual meeting yesterday at the Vashon Emergency Operations Center. A simple affair this year, many of our partner organizations reviewed the last year’s activities and plans for the year and the coming year. See our list of accomplishments which soon should reflect some of these activities. A key item ahead is to hopefully upgrade the VIFR Training Center, and merge our EOC into this larger location. Most homes on Vashon are well built against the seasonal rains and water we face. Still, if a drain clogs, or the incoming rain is heavier than the system can take you may still wind up with a flooded basement or other area of your home. FEMA has a number of guidelines borne of experience for how homeowners can handle floods. Although focused on floods from Hurricane Mathew out east, many of the same guidelines apply to floods that may occur on Vashon. 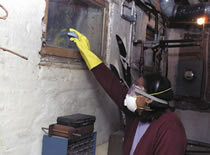 Check out FEMA’s flood clean-up guidelines here. As a glance outside will show, we’re currently experiencing a strong storm. Actually there are two storms, one a day away from the other. Check local weather reports (e.g., NOAA or Weather Underground) for the latest reports as the predictions are changing fairly quickly. Seattle OEM Produces a Humorous Earthquake Preparedness Video–Starring Sasquatch! Seattle Colleges has generously offered to host an Incident Command System 100/200/700 Combination Course at no charge. The course will be held Thu, October 13, 2016 from 9:00 AM – 4:00 PM at South Seattle College, 6000 16th Ave SW, Seattle, WA. If you are interested in participating in any of the VashonBePrepared groups, this is an excellent way to get up to speed on the terminology and concepts used on Vashon – and throughout the United States. In an effort to prepare Seattle communities for ‘The Big One’ and other disasters Seattle may face, Mayor Murray has proclaimed October 2016 as Emergency Preparedness Month. Download a PDF version of this brochure (with better layout!) by clicking here. Vashon Island Fire & Rescue Welcomes National Guard A Note from Fire Chief Hank Lipe Nobody could ever truly be ready for an earthquake as bad as the Cascadia scenario. It will overwhelm even the best efforts of our small fire district and the many organizations and volunteers in the VashonBePrepared coalition. King County is investing in a new regional public emergency alert and notification system which features a public alert service - ALERT King County - to keep residents informed about significant events or emergency situations. ALERT King County replaces RPIN (Regional Public Information & Notification) and uses the capable CodeRED software to drive the system. Spend much time in Seattle? Stay Informed with AlertSeattle! Stay informed when you are roaming the urban lands: Consider subscribing to AlertSeattle – the City’s new, real-time emergency alert and notification system. When emergencies happen, be the first to know. AlertSeattle is your link to real-time, official notifications from the City of Seattle. AlertSeattle is a free service that allows you to sign up online to receive customized alerts via text message, email, voice message, and on social media (Facebook and Twitter). This service is provided by the City of Seattle at no cost; however, message and data rates may apply.